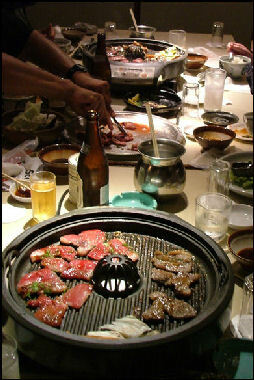 The Japanese annually eat about 13 pounds of beef, 22 pounds of chicken, 70 pounds of fish and one ounce of whale. They consume 130 grams of meat a day, compared to more than 200 grams consumed daily by Americans. Animal protein consumption increased 37 percent between 1961 and 1971, a period when Japan changed from a poor country to a rising industrial power. Many Japanese enjoy eating raw beef as much as they do raw fish. Some sushi restaurants serve it. Raw horsemeat is popular in some parts of Japan. The Japanese love eggs. They are used in sukiyaki and some kinds of sushi and gyudion beef bowls. In some places a typical lunch is a raw egg on a bowl of rice. The average per capita egg consumption is one a day. Supplying eggs are 140 million chicken, more than the population of Japan. Eggs “ along with rice “ are one of the few products that Japan produces enough of it to supply the entire country’s needs. Some of the best eggs are produced by Boris Browns given feed with seaweed and no chemical additives. In the old days, Japanese rarely ate meat. They have traditionally eaten a lot of vegetables and, where it was available, fish. Land was regarded as necessary for growing rice, vegetables and fruit. Using it for cattle or other animals was considered wasteful. Buddhism also discouraged the eating of meat. In A.D. 675, Emperor Temmu prohibited people from eating the meat of horses, monkeys, dogs, chickens and cows. The Temple of the Butchered Cow in Shimoda was erected shortly after Japan opened it doors to West. It honors the first cow slaughtered in Japan and the first violation of the Buddhist tenant against eating meat. In the old days when meat and other foods were scarce farmers netted birds such as the dusky thrush as they migrated northwards during the spring and ate them. Kobe, Matsuzaka, Maeda and Omi beefs are famous for their taste, tenderness, beautifully marbled appearance and high prices. Marbled means that meat has a lot of fat in it, which makes it tender. When cooked the fat liquefies, tenderizing the meat and giving it a mellow, delicate taste. Meat is given a rank of between one and 12 in Japan. The differences between Kobe, Matsuzaka, Maeda and Omi beef are subtle and difficult for non-Japanese to appreciate. Omi beef comes from Shiga Prefecture. It has a tradition that dates back to 1590. There is a record of beef from there, marinated in soybean paste, being given to the Tokugawa shogunate between 1781 and 1788. Beef from the Iga region is also greatly prized. It comes from the Iga area in Nara, where ninjas are also from and not far from where Matsuzaka beef. The cows for Japan's top beef come almost exclusively from the Tajima Valley in Hyogo Prefecture. These cows have official papers with their nose print and information on their bloodlines that goes back several generations. The ancestors of these cattle are said to have arrived from Korea in the 5th century B.C. Producers buy the calves when they are about 8 months and slaughter them when they are between 32 and 35 months old. Only heifers and bullocks (males castrated at three or four months) are sold. Bulls are considered inferior because male hormones are thought to toughen the meat. The best animals are sold at auction on Tajima and Tanba and on Awajishima island, all near Kobe in Hyogo Prefecture. 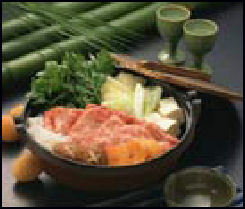 sukiyaki Much of Japan’s high quality beef comes from cows that are fed beer and massaged. The massages increases the animals circulation and ensured the even growth of fat below the skin. The claim that the cows listen to Mozart piped in to their bars appears to be a myth. The cows are brushed with clear liquor to keep their coats in peak conditions. The "massages" are stiff rubdowns with a wire brush that are done about every other day. Some farmers feed beer to their cows every week. Some like it. Other have to be force fed. Six to eight months before the beef is sold, the cows are fed beer to increase their appetite and relieve stress. The cows spend almost all their time in 17 square-foot stalls in barns that are heated in the winter and cooled with fans in the summer. Physical activity is kept to a minimum. One farmer told the New York Times. "The most important thing is, at the early stage the cows must eat a lot of high-fiber foods like hay, wheat bran, corn and soy bean byproducts. That stretches the stomach and make sit big." One farmer who raised Matsuzaka cows told the New York Times he doesn't eat the beef because he becomes too attached to the cows. Yoko Ono made a fortune from cows in New York. shabu shabu Kobe beef is the best known of Japan's tender and expensive beefs. It comes from cattle that belong to wagyu breed, which are carefully bred, raised on special feed, fed beer to stimulate their appetite, and given daily massages with sake to spread their fat evenly for which they are graded. No hormones or antibiotics are given to the animals. Kobe beef bursts with flavor as the fat melts like butter and cover your mouth. When cooked the fat melts into the meat, infusing it with flavor. A well marbled Kobe steaks sell for as much as $23 a pound, and costs up to three times that much in restaurants. 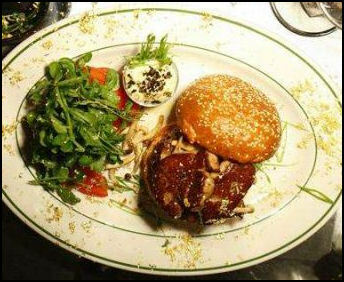 Kobe beef sells as much as $5 a bite at some New York restaurants. The Kobe Club specialized in such meals and has steaks that sell for as much as $150. Kobe beef is better viewed as rating system rather beef from a particular region. Often the cattle that produce Kobe beef come from Kyushu or Mie Prefecture or some other place that isn't anywhere near Kobe. It is even possible to get American-produced Kobe beef if the meat comes from black wagyu that has been raised naturally and has been kept hormone free. Only beef that receives a rating if seven or above can be sold under the Kobe beef label. According to Stephen Smith, a researcher at Texas A&M, Kobe beef is healthier than regular beef. It is much higher in unsaturated fat and has high levels of oleic acid, the fatty acid in olive and canola oil that have ben shown to lower bad LDL cholesterol. Kobe beef is known around the world because Kobe is a major international port. In the old days ships stopped there from all the world. Seamen tasted high quality beef of cattle raised in the area and spread the news. made with Kobe beef The wagyu cattle used in Kobe beef were originally used to pull plows in rice fields and were not raised for meat. They are black and have a glossy coat. Experts say the beer and sake massages are all fine and dandy but what makes Kobe beef special is derived through breeding and a long, careful feeding program. Wagyu means “Japanese.” The highest price ever paid for a wagyu cow was ¥49 million in 1989. Wagyu cattle are fed 36 to 82 months, almost twice as long as American beef cattle. Kobe calves are fed a mixture of straw and oats, Adult are give mixture of corn, bran, oats and barley. The pens of Kobe cows are so clean they hardly have any smell. Kobe-style beef is produced from wagyu cattle in the United States and Australia. Some of it is sold back to Japan. The Japanese Agricultural Ministry wants to pass a law making the use of the Wagyu label exclusive to Japan-raised cattle, excluding wagyu cattle raised in the United States and Australia. According to the proposed law only meat the four cattle breeds---Japanese Black, raised nationwide; Japanese Polled, raised in Yamaguchi prefecture; Japanese Brown, raised in Kumamoto and Kochi prefecture and Japanese Shorthorn, raised in Iwate and Aomori prefecture---or a hybrids from those four breeds can carry the wagyu label and the label would be protected under copyrights and intellectual property laws. Matsuzaka is a small town on the Pacific coast of Japan. Matsuzaka beef is not as well known as Kobe beef because Matsuzaka is not a major port. Only cows raised here can carry the Matsuzaka label. Some say Matsuzaka is better because even though its riddle with fat it has a beefier flavor. Stephanie Strom wrote in the New York Times, "I tried four different kinds of Matsuzaka steak...and found it very, very good, even though I prefer my meat lean. You do not taste or feel the fat when you chew; it's very flavorful. My one complaint is that you can't eat a lot of it; it's too rich." Farmers insist "climate and water" and the "virginity of the cows" make Matsuzaka special. Other say it just mystique. The Japanese food critic Asako Kiso told the New York Times, "There is not a huge difference between Matsuzaka and Kobe beef. Both are high-quality meats, with lots of very evenly distributed marbling." Each year the best cows are brought to the annual Matsuzaka competition, which is held in November. In 1989, at the height of the bubble economy, a championship cow was sold at competition for $392,000. In 2001, in the midst of a long recession, the champion sold for $81,600. The finalists sold for $24,000. Few farmers get rich unless they sell championship animals. Most cows sell for $10,000 a piece, which seems like a lot but is not much when subtract all the labor and overhead. The calves cost around $6,500 and between $3,200 and $4,000 is spent on them in their lifetime. Most farmers have to do other jobs to make ends meat. 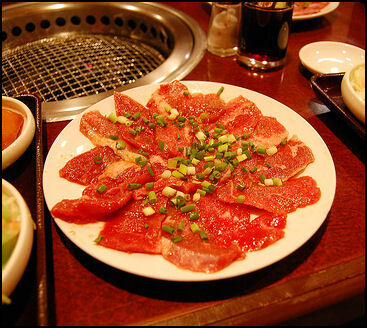 People in Kyushu enjoy eating horse meat and some even eat raw horse meat. Regarded as a delicacy, it is chewy and has a surprisingly sweet flavor. Cuts from the hindquarters are regarded as the best. 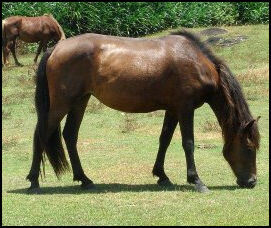 Most of the horsemeat is imported from United States, South Korea, Chile and Australia. Horse is also widely eaten by people on France and Belgium. 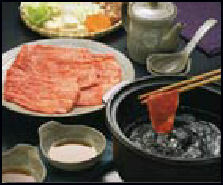 Horse meat is usually eaten raw (basashi), in hot pot (sakura-nabe) and grilled (bayaki). Kyushu-style raw horsemeat is served with ginger and green onions. Sometimes restaurants offer a horsemeat menu in which all the above are served along with a soup with broiled horse innards. An Italian restaurant in Tokyo serves horse lips and Achilles tendons cooked in a wine-bases sauce with celery, string beans and other vegetables. Horsemeat accounts for three percent of the meat sold in Japan. It is promoted in some places as a low calorie, low fat alternative to beef and pork. Those that eat it raw saw it has a delicate, sweet taste and is juicer than other meats, . Kumamoto is the main horse-meat-producing area, It produced 3,100 tons of horsemeat, 40 percent of Japan’s total production. wild boar Beef tongue, cow intestine and pig entrails are widely eaten. Motsu nabe is a stew made with cow intestine, cabbage and tofu. In Osaka and Kyoto, there are restaurants that offer grilled sparrow. In Yamagata people eat pan-friend locusts. Residents of mountain villages in Oita like to eat wild deer sashimi. Pit vipers are eaten in some places as an aid to male virility. People also eat pond snails and crickets. In the old days “mountain whale” was a euphemism for wild game. Wild boar meat is regarded as a delicacy in Japan. Takeo, a small city in the mountains of western Saga Prefecture decided to turn its wild boar pest problem into a money maker. 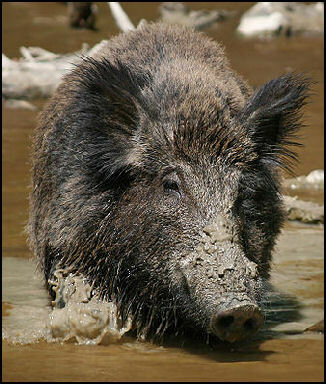 In 2008, wild boars there cases $140,0000 in damage to rice and bean farms and hunters killed 1.541 boars. The boars used to be buried but now are processed and sold to restaurants and supermarkets, with some of profits going to hunters who shot them. In August 2003, a man died from eating raw wild boar that carried hepatitis E. Another man caught the disease from eating the same meat. Earlier two men contacted it from raw deer meat. They were the first known case of people contacting hepatitis E from wild animals. Traditional Japanese insect dishes include hachinoko (“boiled bee larvae”). These days young people are attending insect-tasting events and sampling things like doria casserole with hornet larvae, avocado salad with green tree ant dressing and yanagimysu worms. 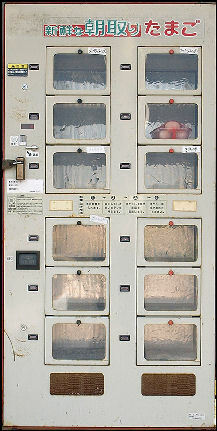 egg vending machine In the old days Japanese rarely consumed dairy products. About 95 percent of all Japanese are lactase deficient. This means they have problems digesting milk products. In traditional Japanese cooking you find no cheese, milk, cream sauces, or butter. In the old days, Japanese rarely ate cheese, which until fairly recently was consider foul-smelling, vile stuff. These days after decades of exposure to Western foods, cheese is very popular. In supermarkets you can a reasonable selection of European cheeses such as Camembert and Danish blue cheese. A cheese made in Hokkaido have won a gold medal for flavor in the soft cheese category at the Mountain Cheese Olympics in Switzerland. Yoghurt is popular, especially with young men worried about their weight and health. In Japan you can get some unusual foods made with yoghurt such as smoothies made and with black sesame and banana or with sweet black beans and aloe. In the early 2000s, Caspian Sea yogurt from Azerbaijan became popular. Many people made it at home with a culture that they added to milk. The culture was often passed on from one friend to another. The first samples are believed to have arrived from the Caspian Sea region in the mid 1980s from researchers investigating why people from the Caspian Sea region live so long. To make Caspian Sea yogurt all you need is Caspian Sea yogurt and all you have to do is place a spoonful of it in a jar and pour in some regular milk and put a cheese cloth over the top of the jar so the milk mixture can get some air. After 24 hours at room temperature it becomes yogurt. To make more repeat the process with a spoonful of yogurt from the new batch. In the spring of 2008, there was a severe butter shortage in Japan. Stores across the nation ran out of it, supermarkets with empty shelves tried to ration the few sticks they had, bakers had to scramble to secure supplies and the government imported 5,000 tons of it to make sure there was enough. How did this happen? Only two years before that. Japan had a surplus of milk that was so severe 1000 tons of it was poured down sewers, breweries were producing a low-malt beer made with one third milk and farmers gave it cartons of milk for free outside railway station. The butter shortage was brought about by several factors: 1) declines in milk production in Japan linked to hundreds of dairy farmers going out of business because the high cost of livestock feed and deceased consumption of milk brought about by media reports that milk was bad for you, 2) a decrease in imports brought bu three-year drought in Australia and 3) the use of milk to make milk and cheese, leaving little left over for butter.